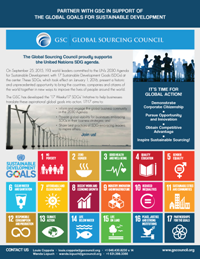 The Global Sourcing Council (GSC) is a voluntary, public-private initiative, registered with the IRS as a non-profit 501(c) (3) status, that is focused on sustainable, socially responsible sourcing practices. By bringing together businesses, industry organizations, academics and trade representatives of different countries, the GSC provides an open forum for discussion of social, economic and political effects of global sourcing arrangements. Through research, publications, education and dialogue, the GSC promotes an understanding of roles and impact of all stakeholders in global trade in goods and services. The GSC addresses timely issues important to any company involved in global business operations and to any country where sourcing is taking place.